Today we’re launching a survey to gather your views on how the department runs digital consultations. 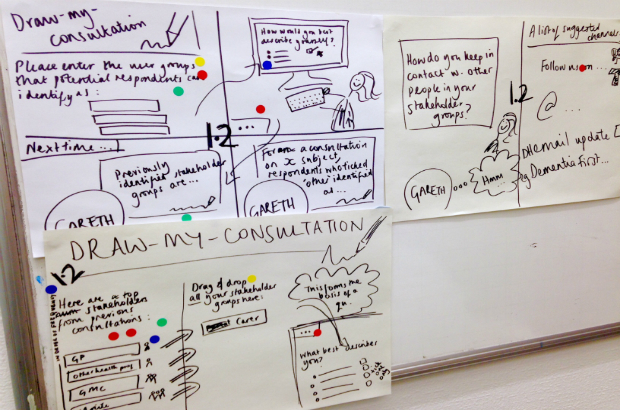 What would encourage you to respond to a digital consultation? What would put you off? The Department of Health runs consultations to find out what people think about proposed new policies or changes to a current one. We run these via GOV.UK and CitizenSpace, or through custom sites such as the one we built for the Care Act. Both work well but we’d like to dig a little deeper into how to make consultations as user focused and valuable as possible both for respondents and policy makers. We’re midway through a Discovery project and have been busy speaking to user groups through a series of workshops and interviews. We’ve learned a great deal about what motivates potential respondents to take part in consultations, what challenges organisations face in collating quality responses, and what would support policy makers to run high quality consultations. We’ve gathered 37 user stories and prioritised the most important, and used those stories to brainstorm initial designs for a potential Alpha. The insight we gather from our survey will take us a step closer to creating a best practice model for digital consultations. There are 9 questions that will take no longer than 10 minutes to answer, and every response will be read and considered by the team. Let us know your views! The link to the survey takes you to a Google page which asks for your email address and password. I've used my DH email address, but have no idea about the password - I've tried several to no avail, so I don't think I have one for this. Thanks very much for flagging this Paul - the survey settings have now been changed so you don't require a Google account to respond. Apologies! What is the point of responding to any consultation that DH runs? Earlier in the year they ran a consultation Call to Action for pharmacy. They promised a response by autumn. Now they say the response is in the Five Year Forward View. Is this clever manoeuvring by DH or deceitful? Pharmacists will need some convincing that DH is genuinely interested in their views and act responsibly and in a timely manner. At present all the hard word work done by more than 600 respondents is appearing to be wasted. Do you trust the DH to behave with integrity? Thank you for your comment. Are you referring to the Pharmacy Call to Action Consultation? This consultation was run by NHS England, rather than the DH. There are contact details at the bottom of the page should you wish to contact them for an update.